Join us for off-track betting connected directly to Turf Paradise. Place your bets every day! We have the only off track place betting on the White Mountains! 857 E White Mountain Blvd. The Lodge Sports Bar & Grill is your locally owned and operated, fun-loving, and relaxed hangout, with a terrific staff that makes you want to come back time and time again. The Lodge Sports Bar and Grill offers Arizona’s White Mountain the largest selection of draft beers on tap to satisfy your thirst. If you’re looking for a night out on the town, look no further. Come shake it on the dance floor Friday and Saturday nights with the hottest DJ or live music! Looking for something else? We have three pool tables, darts, large flat-screen TVs, and a large projector screen with surround sound—perfect for watching your favorite game! Why be bored? We have activities or entertainment every day and a great menu to go with your ice cold beer! 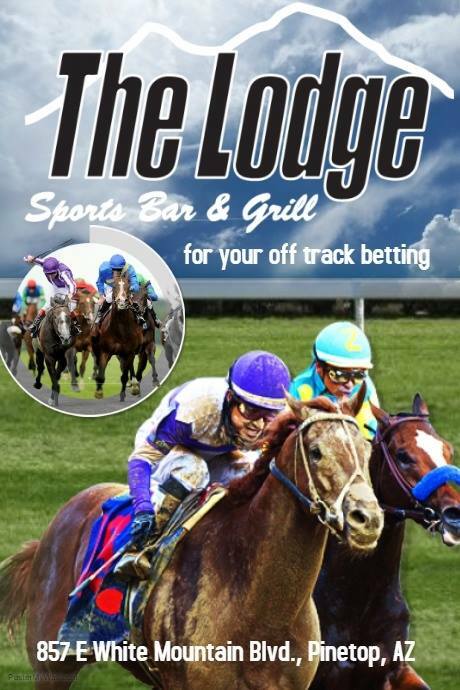 If you’re looking for a night out on the town, look no further than The Lodge Sports Bar & Grill.